The term ‘herding cats’ has been widely used to describe the challenge of leading academics. The phrase reflects a number of assumptions about academics: that they are independent, determined to go their own way, and largely focused on individualistic (and sometimes hedonistic) desires. Is this the case? In my experience, the issue is more about leadership than the nature of the academic. Many universities are focusing on large-scale institutional change. Educational reforms, re-prioritisation of funding and resourcing and academic performance have been large foci for the last few years. The focus on increasing and mapping academic performance has been particularly notable. Academics may be reluctant to embrace the proposed changes – particularly if they affect academic roles, disciplinary affiliations or performance standards. Some institutions are adopting processes that assume academics must be controlled and forced to comply with planned reforms. This strong and aggressive leadership approach is being widely used across the sector – with some significant consequences. Many academics feel that they are being herded and marshalled into pre-determined holding pens designed to regulate their practice, without respect, forewarning or support. Senior academics are starting to question their future, seeing retirement as a desirable option while less secure junior academics are starting to wonder if they have the necessary tenacity to reach the rising goal-posts. These consequences can be diminished markedly if we consider what drives academics and how leaders can provide a constructive interface to encourage synergy between institutional reforms and academic needs. Academics are high-end knowledge workers, with a keen desire to perform their disciplinary role with high success. Recognition and valuing are important to them: they are reared on peer review and external accolades. If they are not feeling valued, they become more insecure and destabilised. In harsh climates, they will hunker down, reverting to the tasks and activities that they know best and which they feel affirm their worth. Unfortunately, these may not be the things that are valued by their institution. And in many cases, the opportunity to adapt and re-orientate is very short and hard to achieve. The sector is seeing high levels of anxiety related to academics who do not possess the right skills to excel. A key principle in effecting academic engagement is to recognise that they can be agile, responsive and incredibly creative – if they understand the goalposts. The key is ensuring they are well informed about both priorities and measures for success. In these performance settings academic leaders can also feel beleagured. They feel isolated and disliked because they are the representatives of “The University”. Their role in assessing an academic’s merit can be a major determinant of that individual’s future employment prospects. The increasing focus on financial viability of teaching and academic outputs may be regarded as high end perfomativity: where academics are viewed as binary inputs: productive – unproductive. Contributions to service and innovation can be undervalued – to the detriment of the institution and the individuals who contribute in these areas. University leaders play a key role in acting as interpreter, consultant and facilitator to ensure institutional and academic priorities are in synergy. The leader as interpreter: Many academics remain ill-informed about the sector at large and the pressures that universities are experiencing. They may be largely insulated by their busy roles, focusing on maintaining their current trajectory and habits. Institutional reforms threaten that security, and need to be explained and outlined. Academics value the chance to hear about proposed changes and how they may impact on their own setting and role. They need to feel that the reforms will make sense and to have some idea about likely consequences. They also value a vision as to what the future will look like. The leader plays a critical role in interpreting the various forces in evidence and articulating that future and the logic behind the change. Some individuals will seek quite robust debate as to the reforms. Academic leaders will need to be resilient and well-informed as they work through the discussion that needs to take place. The leader as consultant: Academics value the opportunity to contribute their ideas and perspectives. Leaders need to consult with their diverse constituents. While some of the suggestions may be unviable, many will offer considerable richness in building organisationally-fit options. The very process of consultation will also provide an important transition between the old and the new. It is not so much what is suggested, but the process of thinking and testing the new context. The leader as facilitator: Reforms often anticipate staff will be agile and ready to segue into new roles and processes. Assumptions about the skills and capabilities that will be found in the community can undermine many good plans. The leader plays a key role in identifying the core capabilities that will be necessary to take the community forward, and to ensure the key players in the change are well prepared for their new tasks. Collective learning can be particularly powerful, as it also encourages a culture shift across the community and encourages joint problem-solving. They may be a little cat-like: intelligent, curious and adaptive. However, academics do not need to be herded to force compliance. They will show great willingness to contribute to reforms if they are offered clear justification, good leadership and an opportunity to contribute to the strategies. This entry was posted in Academic performance, Leadership, Leading change on September 11, 2013 by Shelda Debowski. Source: Debowski, S. (2012). The New Academic: A Strategic Handbook, Open University Press. Academics at any stage of their career benefit from thinking about how well they are positioned for success. 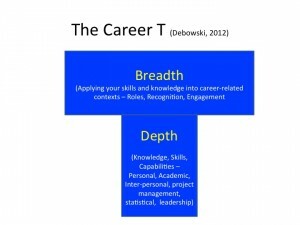 Academic success can be reviewed using a very easy tool: The Career T. This little model suggests that academics must perform across two broad domains of activity: by building and expanding expertise in their chosen field of knowledge (Depth); and, by sharing that expertise in various ways, or contributing to its broader use by others (Breadth). The Career T is a very quick reviewing tool to assess your effectiveness and the suitability of your current career strategy. First, take a sheet of paper and draw a fat, large T-shape on the page. Start with the base of the T and note down all the area of expertise, core knowledge and talents that you possess. You can do this as a broad review of every area of your academic work, or focus more specifically on a particular part of your activities, such as teaching or research. Now, move to the horizontal space and note down all of the ways you have applied that expertise. This might include work roles, committees, projects, your publications… any other ways that you have translated your knowledge or contributed to the broader development of your community. Do you have good evidence of roles and activities? Or have you kept beavering away on your depth without considering its translation? If your horizontal space is very limited, it is a clear signal that you need to act as a high priority. Are your activities diverse, showing how versatile you are? Or have you stuck too long on one role that does not demonstrate your many talents? Is there evidence of leadership i.e. taking ownership of projects? Can you show that you can work well with other people e.g. on committees or projects? Have you been setting stretch goals? Is it time to aspire to higher targets? You can now use the Career T to help you plan your next steps by looking at the gaps in your profile. Then identify how you might address those gaps. Are there new roles or activities that you feel will supplement the profile that you have mapped? Identify the most beneficial and consider how you will segue to these new opportunities. Mentors, sponsors and models can help with ideas on how to achieve these goals. Importantly, if you have been doing the same thing for more than two years (e.g. course coordination), it is time to think about handing over to another colleague and moving into a different role that showcases your skills in other ways. Building a balanced and challenging portfolio to show your depth and breadth is a useful way of ensuring you remain competitive and remarkable. You can read more on career strategy in Debowski, S. (2012) The New Academic: A Strategic Handbook, Open University Press. This entry was posted in New academics on August 30, 2013 by Shelda Debowski.